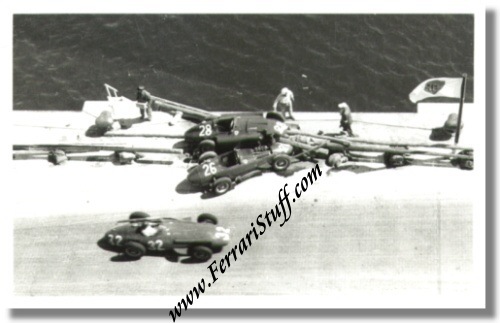 2 1957 photos of Peter Collins and Mike Hawthorn Ferrari Lancia crashed at the Monaco Grand Prix. 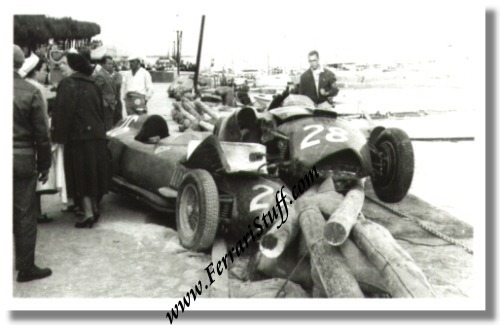 This is a set of 2 1957 photos of the wrecks of the Lancia Ferrari D50's (801) of Peter Collins and "mon ami mate" Mike Hawthorn on the edge of the harbor of Monaco. The incident happened in lap 4 of the 1957 Monaco Grand Prix after leader Stirling Moss "lost" his Vanwall in the chicane. Peter Collins swerved to avoid Moss but hit the wall while Mike Hawthorn rammed Tony Brooks who braked hard to avoid the cars in front of him. Everybody escaped from this accident unharmed. The photos each measures approximately 5.5 x 3.5 inches. The set is in mint condition, carries not references to the photographer and appears to be a ca. 30 year old prints from the original negatives.